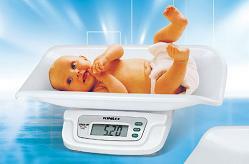 Newline Digital Weight Track Baby Scales, White. This is overall a very good value baby scale. The comfortable, rounded weighing tray fits securely to keep baby safely in place. This scale allows you to track your child's growth from infant to toddler and will provide years of use. Weighing modes include pounds (lbs) and kilograms (kg). Max capacity is 46 lbs (20.5kg) with accuracy to 0.5 ounce (10g). The scale also displays the baby's average weight for the time period. Also great for pet or bulky measurement. Auto shut-off. Copyright © 2011 newlinescale.com. All rights reserved.